Samsung is definitely no stranger to showmanship, as evident by its grand unveiling events. However, those are usually reserved for its top of the line models, like the annual Galaxy S and Note editions. The rest of the OEM's lineup typically gets a formal announcement as well, but it seems the Korean giant has decided to skip the formalities with the new 2016 edition Galaxy J1. The phone went from leaks and renders, straight to sales as it's now available at a number of electronic stores in Dubai. On the plus side, this surprise arrival does eliminate the need for any more speculation regarding the handset's specs and price tag. 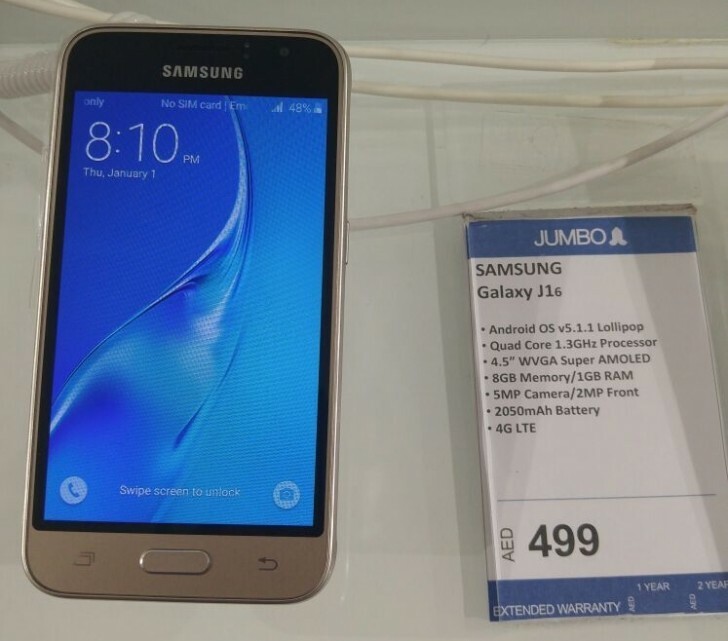 The new Galaxy J1 retains the budget-friendly nature of its predecessor. It is equipped with a 4.5-inch display, with a resolution of only 480 x 800 pixels, but still using Super AMOLED technology. Running the show is a quad-core chipset, clocked at 1.3 GHz, probably the Samsung Exynos 3475 SoC. Memory is set at 1GB and there are 8GB of onboard storage. The camera setup of the 2016 J1 consists of a 5MP main shooter and a 2MP front one, just like its predecessor. Powering the show is a 2,050 mAh battery. The new Galaxy J1 also comes with 4G connectivity in its base version – a feature you could get with the old J1 as well, but only if you spring for the J1 4G or J1 Ace. Speaking of which, while a bit more powerful, the new J1 2016 comes quite close to what the latter J1 Ace has to offer. The local price for the J1 2016 is AED 499, or around $135 and the J1 Ace can be found for $10 to $20 less. So, if you have your sight set on one of them, be sure to shop around for offers on either handset, as you could end up saving even more. Thanks, Jomichan George, for sending this in!